Sorobon Beach Resort has partnered with Bjorn Dunkerbeck and Philippe Bru to open The Dunkerbeck Pro Center in January of 2018! Visit the website with full information on rental prices, equipment and more! A windsurf school, meant for all levels, from beginners to experienced and titled professionals, the Dunkerbeck Pro Center offers anyone a chance to enjoy the sport in the most perfect wind and air conditions! 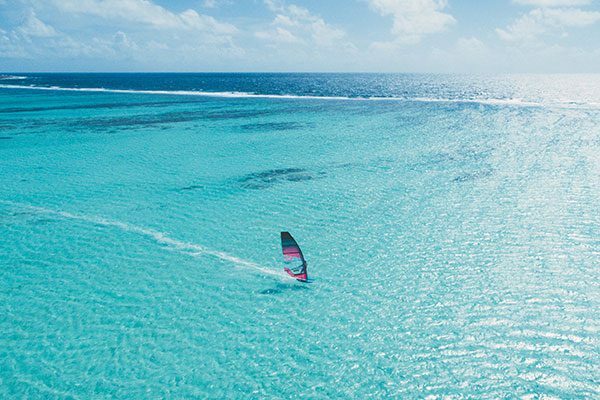 The Dunkerbeck Pro Center offers water sport enthusiasts a unique opportunity to experience the easiest imaginable windsurfing! Imagine waist-deep waters stretching for over 2km engulfed in constant strong winds! It promises safety for beginners and only fun for professionals! Bjorn Dunkerbeck is a windsurfing legend, holding 42 World Titles, as well as the Nautical Speed Mile record, and the World Record for Open Ocean Speed. Philippe Bru, the CEO and founder of the Philippe Bru Organization, is known in the windsurfing world as the founder of the DefiWind. Two years the event travelled across the Atlantic to the Caribbean and, with the help of Bjorn, has been taking place on Bonaire, as well! No need for a wetsuit! Maximum time in the water: guests of Sorobon Beach Resort can access their gear and the lagoon 24/7! Starboard boards and Goya sails and boards for beginners, intermediate and pro windsurfers!